What an aca-awesome way to start the new year! The Barden Bellas are back! 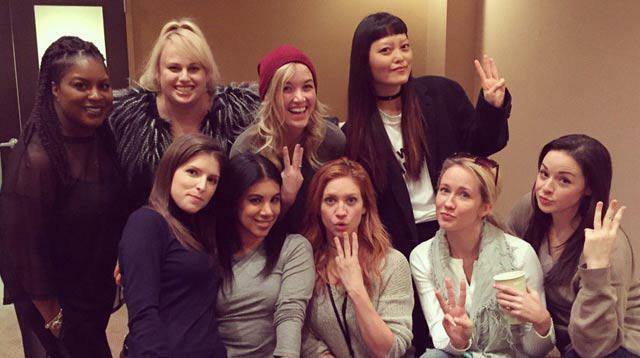 The first official cast photo of The Pitch Perfect 3 stars was just released and we are beyond excited! Leave it to resident funny girl (aka the best human in the world) Rebel Wilson to tweet a pic of the cast’s first day on the set of the film. "Day One Pitches! #PP3," she writes, while a bunch of them hold up the number three on their fingers. Looks like the third time really is the charm! Anna Kendrick, Brittany Snow, Anna Camp, and the rest of the Bellas are all in for the third installment of the film. Pitch Perfect 3 is slated to hit theaters in December 2017.